Top Instagram Murals of August - Selection by Widewalls Readers! It was a hot and warm August. While many galleries were closed due to vacations, the world of street art was functioning as it always does. It seems like street art never sleeps. But, our team was working hard as well, including are social media team, who regularly posted new murals on Instagram Widewalls profile. Some quite amazing murals were created during the summer, all over the world. 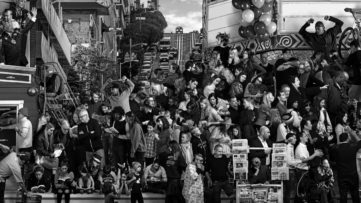 As usual, Widewalls has been covering all major street art news (do not forget to check out our latest street update). In the end of each month, we are reviewing what our readers liked the most. We are presenting top 10 murals you liked the most in August, and don’t forget to follow us on Instagram! 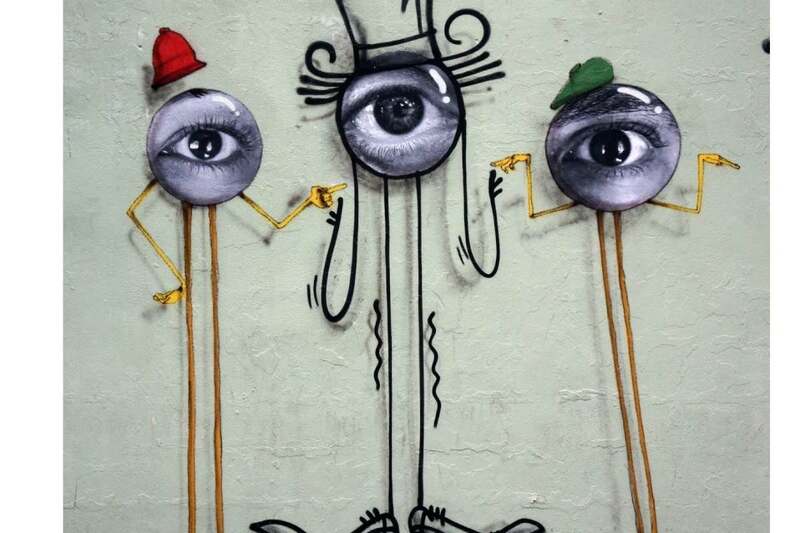 Three great urban artists – Os Gemeos, JR and Mr Andre collaborated in creating a great mural in a street of New York City. Local crowd will be able to recognize Os Gemeos’ tagging character, JR’s eyes and Andre’s recognizable silhouettes. This piece was created just one week after Os Gemeos and JR collaborated in creating the largest mural they have made in the last couple of weeks and it honors the old school NYC B-Boyz and is a reminder of their street art beginnings inspired by the New York hip hop culture from the 1980s. 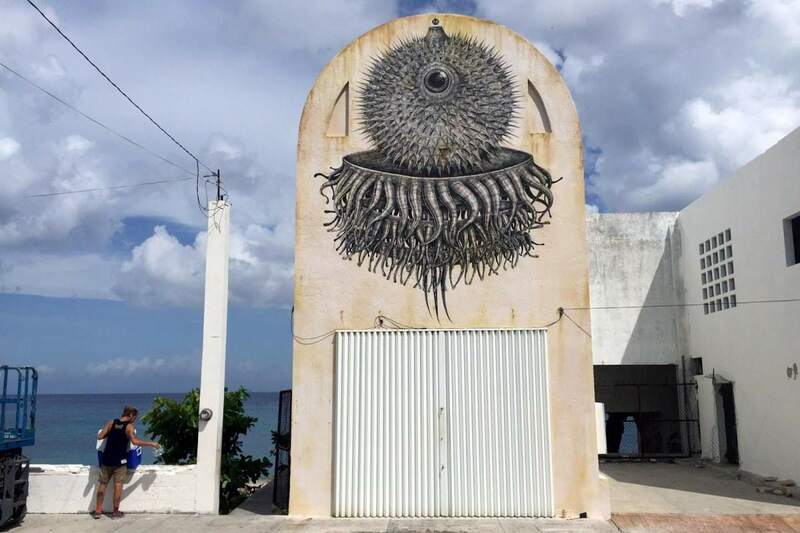 An amazing art event – Sea Walls Murals for Oceans festival took place in the island of Cozumel in Mexico, from July 16 until July 26, 2015. The event had a wonderful goal – to save Mexico’s oceans and endangered marine ecosystem. Thirty internationally acclaimed urban artists came to Mexico, and painted 30 large-scale murals. Famous Puerto Rican artist Alexis Diaz spent a week creating highly detailed piece, representing the evolution of a sea animal. This amazing piece also reminds all of us in the need to preserve marine ecosystem, and to protect our environment. How to Paint a Mural? Read our Tips! 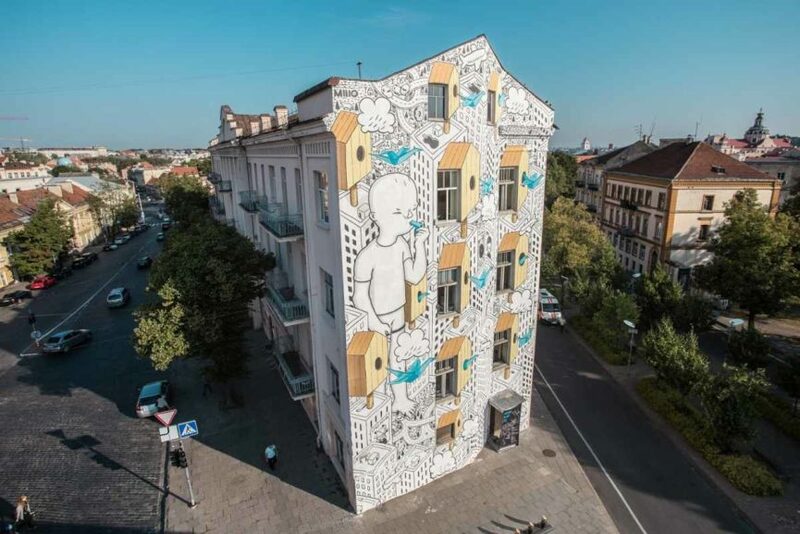 Italian urban artist Millo participated at the third edition of the Vilnius street art festival. Great murals were created, while Millo painted a building, creating for the first time site-specific mural, incorporating existing windows and other architectural details into the monochromic painting. Millo graduated from architecture, so we believe it was not so difficult for this great artist to play with different architectural details. The piece is located near Hale Market (one of the oldest Vilnius’ markets), not far from the train station. WD - What if I fall? But imagine, what if you fly? It was a busy summer for WD aka Wild Drawing. He participated at the Malta street art festival, and after that great event, he returned to Athens, Greece to finish his latest mural. This Athens-based artist recently created an amazing mural depicting the chained, tired man – Hope Dies Last. 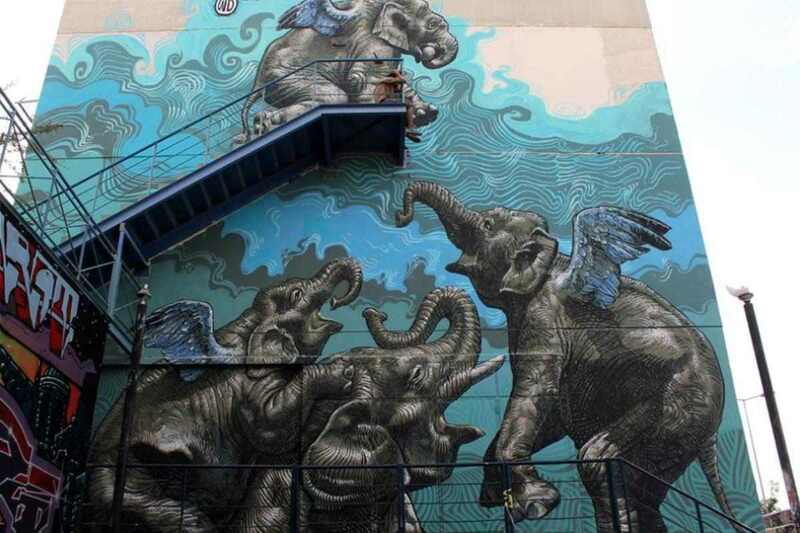 However, his latest mural depicts a group of flying elephants. The work is entitled What if I fall? But imagine, what if you fly?, and although we got used to see politically inspired works by WD, this great piece will certainly attract a lot of Athenians’ attention. If you like the art of WD, be sure to read the interview with this amazing artist! OK, we wrote so much about Dismaland, that we could not add anything else (at this time). 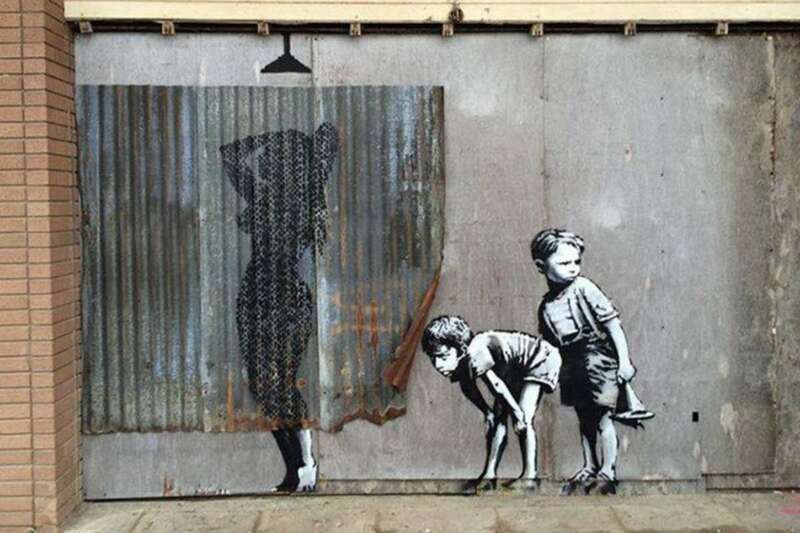 With recognizable style, Banksy created a humorous piece, depicting two boys who peek at a woman taking a shower behind the iron curtain. 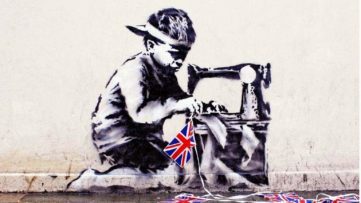 Since artworks in Dismaland are a bit dark and (for someone) too satirical, this Banksy’s piece will add some joyful atmosphere in the artist’s dystopian theme park. 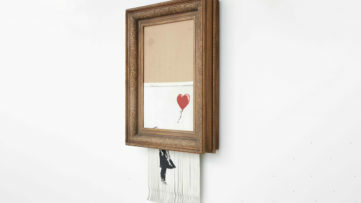 Don’t forget to see some videos from the Banksy’s twisted theme part! 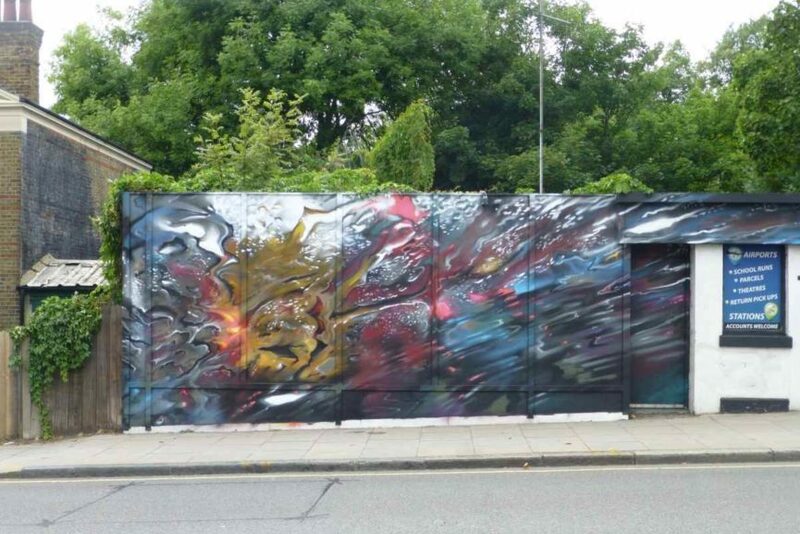 British artist Dan Kitchener visited Islington, a district in Greater London, England and part of the London Borough of Islington. In Tuffnell park, he created a beautiful mural entitled Hyperspeed. The mural is characterized by the artist’s unique style, full of colors, a bit abstract, yet aesthetically simply amazing. Amazing Australian artist Adnate participated at the Australian Indigenous Cultural festival called Garma. This art event takes place in Arnhem Land, in Northern Territory of Australia, with predominantly Aboriginal population. 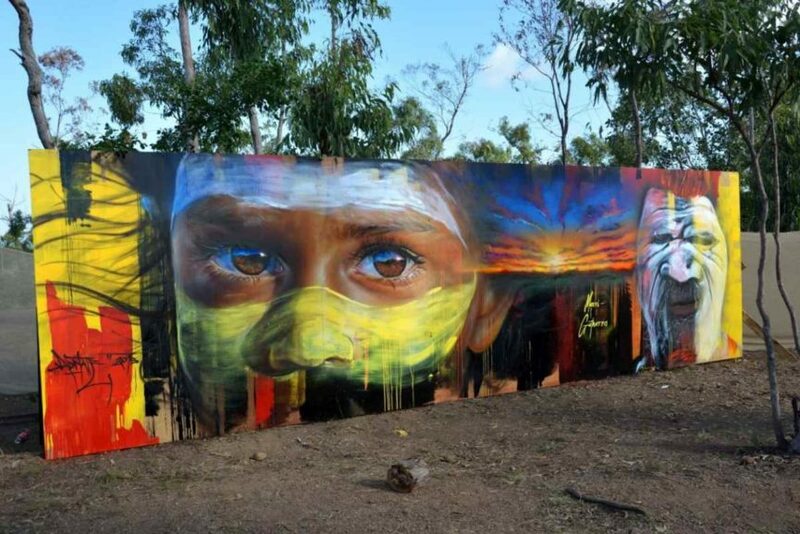 Adnate’s piece is a form of a portrait – a portrait of a young girl from Yolngu clan, while on her right side is a man representing her grandfather. The mural is entitled Mari – Gutharra, which in Yolngu language means the special relationship between granddaughter and grandfather. If you missed, check out our top 10 Instagram Murals in July! Italian urban artist Eron participated at the third edition of Icastica – an international cultural and art event taking place in the Italian city of Arezzo. The amazing piece entitled Soul of the Wall was painted on the site where a bomb destroyed a huge part of the Arezzo military complex during the Second World War. 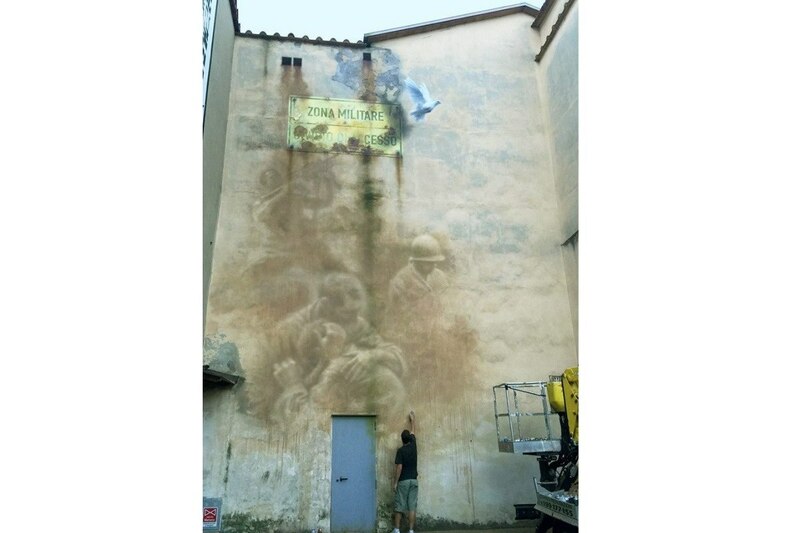 The mural is located in the compound of former military barracks, near Piazza del Popolo, in Arezzo, Tuscany. Julien “Seth” Malland, better known as GlobePainter has recently created a huge, beautiful mural in Montreal. This French artist is known for his playful characters. 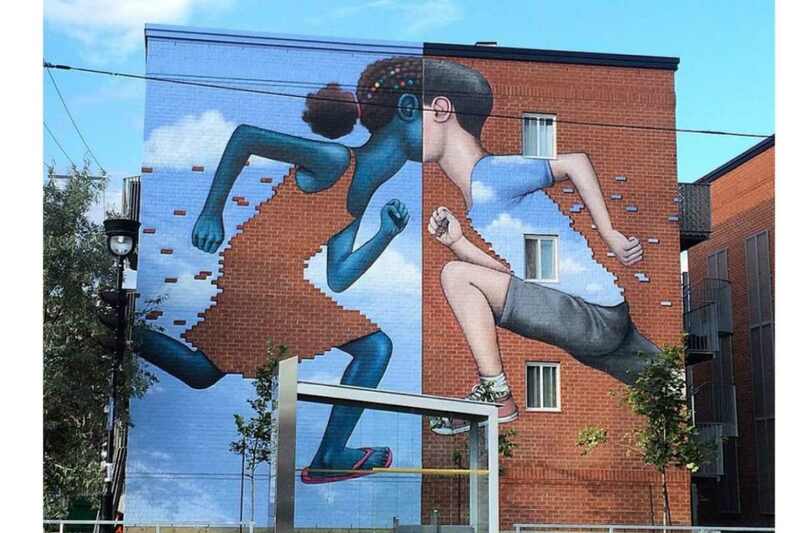 The piece depicts two children running into each other in the artist’s recognizable faceless style, but also incorporates the building’s brick facade to create their pixelated clothes. The mural was organized by MU, an organization that coordinates murals around Montreal. What is the history and the meaning of mural? It seems that Millo is a winner of this top 10 Widewalls Instagram murals list. We have already mentioned his piece in Vilnius, but another work by this great Italian artist found its place on the list. 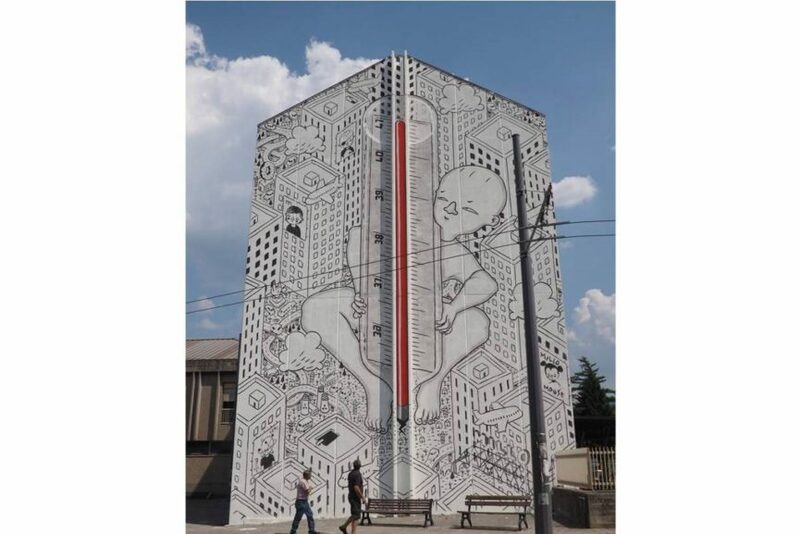 This time it is a work entitled 41 Degrees, that depicts one of his bald characters hanging off a thermometer which shows a temperature of 41 Degrees. The mural is located in the city of Avellino, in the Campania region of southern Italy, where the artist was invited to participate at the Boca / Bonito Contest Art. For the latest news from the world of street art, sign up for My Widewalls! It’s free of charge!